One of our favorite things to make for dinner on a cold fall or winter day is a hearty soup, served with some crusty bread. Typically we will make our soups on the stove top, but we are so busy these days with our little one that we made this one in the slow cooker. Aren’t slow cooker’s great? I mean, you can toss a bunch of ingredients in it and leave it to cook all day without having to do anything else with it. 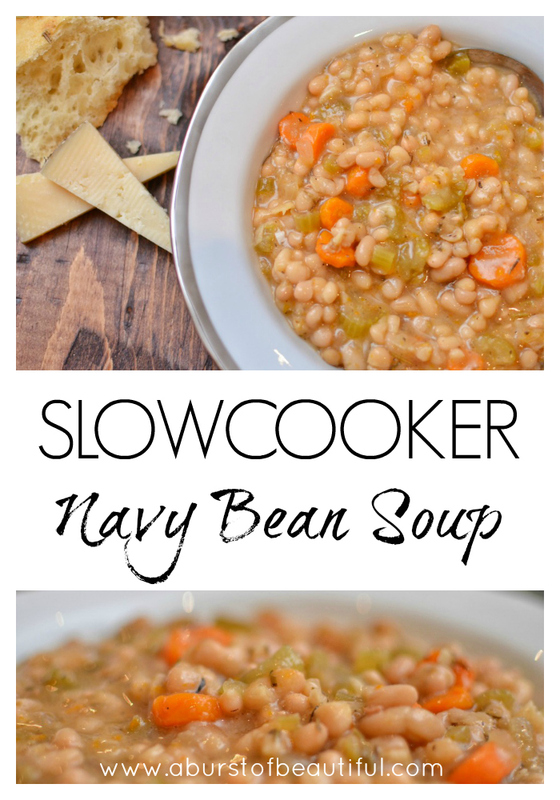 I want to share our Slow Cooker Navy Bean Soup recipe with you today. This soup recipe couldn’t be any easier. It is so filling that you will only need one big bowl, leaving you lots of leftovers for the next day. Grab a loaf of crusty bread and warm it up in the oven just before you’re ready to serve the soup. If you like this recipe, you’ll also want to try our Homemade Chicken Noodle Soup or our Loaded Potato Soup Recipe‘s! NOTE: Some reader's have found that they need to soak their dry beans overnight, we didn't, however, you may want to soak them just to be sure! Combine all of the above ingredients into the slow cooker and stir. Once cooked, add salt and slightly mash up some of the beans against the side of the slow cooker to thicken the soup. Serve with some crusty bread and salty hard cheese and enjoy! I’m making it right now. I’ll let you know. Didn’t saute anything first. I know is supposed to meld the flavors but I’ve never done that in Amy crock pot recipe except top brown meats. I’ll let you know. Thanks for simple recipe. I knew I was missing something going by heart! It was the paprika! What would you sauté? There is nothing to sauté and there is nothing that says anything about sautéing anything in this recipe! I know that some people like to pre-saute onions, garlic and spices in a slow-cooker recipe before they add everything else. It’s not necessary though, and we’ve never done it before to this recipe. I thought I might have to soak them too but I decided not to and they worked just fine in the slow cooker since it cooks for such an extended period of time! I am having company over in 2 hours for this navy bean soup. After it had cooked for 6 hours on high, the beans were hard as a rock. I transferred everything to my soup pot on the stove and have 2 hours to soften up these beans. Soak them overnight!!! If your beans are still hard as a rock after the long cook time, it isn’t because they weren’t soaked, it is because they were old beans. Old beans will never get soft, even if you overnight soak them. Unfortunately there isn’t any way that I know of to tell if beans are old or not… I just buy the name brands that have high turnover, so I rarely get any that have been on the shelf for several years. I made this yesterday and didn’t soak the beans. Turned out perfect. My corckpot has 3 hours left on the low temperature. The recipes.has a lot of liquid still left,is that normal? And when the 8 hours has completed will it thicken or still have a lot of liquid? Don’t worry, once you get to step 3 you will mash up some of the beans against the side of the slow cooker and stir. That will thicken it up! Hope you enjoy! Do you have to sauté the vegetables first or is the olive part of the recipe (to be put into the crock pot)? Thanks. This recipe was awesome. I did soak the beans overnight.it will be a family favorite going forward. So glad to hear you and your family enjoyed it Pati! I made this tonight and it was super delicious! It is going in my family cookbook that will be handed down to my kids after I am gone. Thank you for sharing. It will be a forever recipe for our family for generations to come. Can I use northern beans? Hmm, I’m not sure. We’ve never used Northern Beans for this recipe. I think they are a bit larger than Navy Beans, so you may have to adjust cooking time. What size crockpot do I use for this recipe? Maybe I missed it. We used our 6 qt crockpot for this recipe! trying this today for my daughter who is pregnant and very sick. She has not been able to eat and nothing sounds good. I thought this high protein and kind of starchy dish will maybe be something she could tolerate and be good for her and the baby. This is one of our most popular recipes and we’ve had great feedback on it, so hopefully this does the trick for her!! Enjoy! I grew up poor, so I know my way around beans and cornbread. We would always eat the pinto variety but I have recently grown to love Navy beans. My mother made some last week that would knock your socks off. I got her recipe and it’s pretty much like yours, save a few ingredients. Maybe she frequents this site. Hi mom! Making 2 lbs so I can freeze some for work lunches Oh Yum! Thanks for this easy recipe, I heated my broth to boiling before adding it in, the soup took 5 hours to cook on high! I added leftover ham and some salt pork, it smells so good! Going to serve with crackers and a salad. Mmmmm sounds delicious! Ham would be an amazing addition to the recipe! You have to use navy beans or it’s not navy bean soup!